The New York Times has taken a stab at making its online newspaper more akin to the traditional paper experience that we’re all familiar with. TimesReader 2.0 delivers the New York Times directly to your laptop in a digital format that looks and functions almost like a paper newspaper. It even adds a few features that make it better than a paper newspaper. It’s organized like a newspaper, but is updated every few minutes so you always have the most current breaking-headline news. Skim the headlines to find what you’re interested in, or jump to your favorite section. The famous New York Times crossword is one of the coolest features. If you’re stuck on a word, you can get a hint. If you’re used to doing the crossword in pencil, you can easily erase a mistake and take another stab at a solution. TimesReader downloads the New York Times locally to your Windows, Mac, or Linux computer so you can read the paper wherever you go. In fact, it stores the last seven issues so you can get caught up at your convenience. A subscription to TimesReader costs $3.45 a week, but if you’re an avid newspaper reader, it’s well worth the cost. This is slightly more than the Kindle version ($13.99 a month). But the Kindle version doesn’t include the crossword puzzle, and omits some images and tables. And it’s way cheaper than the print version, which runs around $5.85 to $7.40 a week, depending on your location. 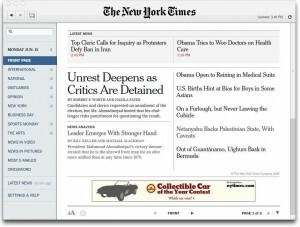 You can download and install TimesReader 2.0 at www.nytimes.com. Scroll to the bottom of the page to find a link. If you don’t see the link, just search for TimesReader. Here’s hoping more newspapers become available in this handy format. In my opinion, the paper paper will not go away. However, my guess is that it will continue to change, such as The Oregonian continues to do. They’ll have to pry my hardcopy from my cold, dead fingers! I’m not ready to change….!!! Good riddance to those oversized pages with the folds that collapse on themselves, though. Hmph. I know it’s inevitable, but I’m going to miss the paper newspaper.